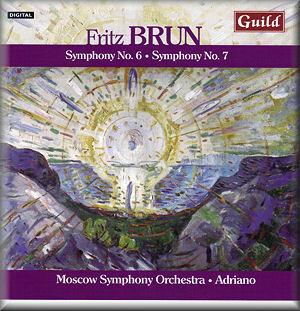 An excellent disc, this presents the Sixth and Seventh Symphonies of the all-too-little-known Swiss composer Fritz Brun. The Moscow Symphony Orchestra perform under the astute baton of Adriano. The conductor is known by his first name only. As an aside, for those interested, do let me direct you to Rob Barnett’s fascinating interview with him. The Sixth Symphony opens the disc. Composed in 1933, it is a work of almost schizophrenic contrasts, atonal and bi-tonal elements set against music whose harmonic language is rooted in the late eighteenth/early nineteenth centuries. Its inclusion adeptly complements the choice of Edvard Munch as the artist of the disc’s cover painting. The Moscow Symphony Orchestra project the acerbity of the Symphony well, without losing any of the more lyrical elements. Although the Seventh Symphony is more immediately accessible, it has greater impact following an awareness of the more acidic, “knottier” idiom of the Sixth Symphony. The language is very striking: an harmonic landscape often akin to Brahms but with a deportment of instrumental forces that is reminiscent of Bruckner in terms of “blocks” of instruments. The Symphony has a strongly motivic basis that demands translucency of texture – exactly what is achieved here by Adriano and the Moscow Symphony Orchestra: rich and focused sound, yet never overly dense. The brass, in particular, play with a lyrical emphasis and warmth that is refreshing, especially in the Allegro fourth movement, where they are used sparingly and the sound is well balanced and clear, though never aggressive. The booklet notes, written by the conductor himself, are thoughtful and thorough both in terms of biographical information about Fritz Brun and also on the works featured. The entire disc is well-presented. This is a desirable CD, and one that I hope that will prompt other listeners, as it has me, to explore further the intriguing world of Fritz Brun.